I love dogs and one day, when I spend less time in London and/or we retire I hope to have one of my own. However. I hate dog owners (probably a paid dog walker who doesn’t care less) who do not pick up after their dogs in Hyde Park. I wonder if a loving dog owner would like to drop down and give me 5 (press-ups) and find their hand in their darling pooches business? And then be unlucky enough on the same morning to get a knee full? Enough said. I got unlucky while doing too many burpees this morning! Fortunately there were lots of puddles to wash hands and knees in and wet grass to roll/wipe my knees on. I was also sensible not to touch my face for the rest of the class, and even after a hand wipe not to touch any food until I’d scrubbed and soaked in the bath! So please think when you are out walking a dog. It might be you, or even your children, sitting in, rolling in or getting a handful of poo if you don’t pick it up. Janathon day 22. 1 BMF class (3 miles run) 5 miles cycled. Categories: fitness, Janathon | Tags: British Military Fitness, Dog mess, Hyde Park, Janathon | Permalink. So with you on this rant, I can also smell it from here-the poo that is! 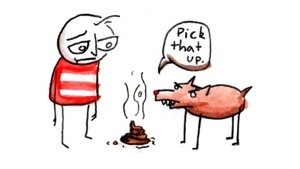 I think I’m the only person in the world who’s not bothered about dog poo. I hate it. Did you k ow it can cause blindness? Gross, I can’t believe other dog owner who don’t pick up the poo especially when it’s in the middle of the path! Yet I am out there with a torch clearing up after my two dogs. Im fairly sure my dog looks over his shoulder when he’s done and I think I once heard him say “you can pick that up for me.“ I dont undetstand people that haven’t worked out how to consider others and the world around them. Luckily they are a minority, just a shame they have a.disproportionately large effect on us. Now, more running!